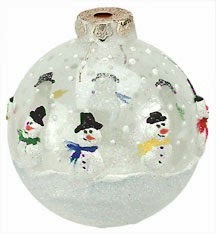 Paint a clear ornament with textured snow and little snowmen for a winter wonderland look. Each of the snowmen has a different colored scarf for a splash of color. 1. Apply Snow-Tex on bottom of ornament. Let dry. 2. On top of ornament, apply dabs of Snow-Tex for each snowman, spacing around the ornament. Let dry. 3. Dot Snow-Tex over open areas of ornament. 4. Paint hats, eyes, mouths, and buttons Lamp Black. Paint carrot noses Tangelo Orange and scarves assorted Americana Acrylic colors as desired. 5. When dry, apply Crystal Twinkles over entire surface.